If there is to be peace in the home, there must be peace in the heart. ~Lao-Tzu Peace is not something you wish for. Peace is something you make, something you are, something you do, and something you give away. 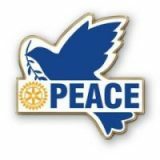 © 2019 The Rotary Club of Peoria, Arizona U.S.A.